Learn to kayak or stand-up paddleboard—and advance your skills to the next level. The Kayak Foundation provides individual and small group classes as well as open paddle sessions for kayaking and standup paddleboarding. We focus on safety, understanding the Harbor environment—and having fun on the water. 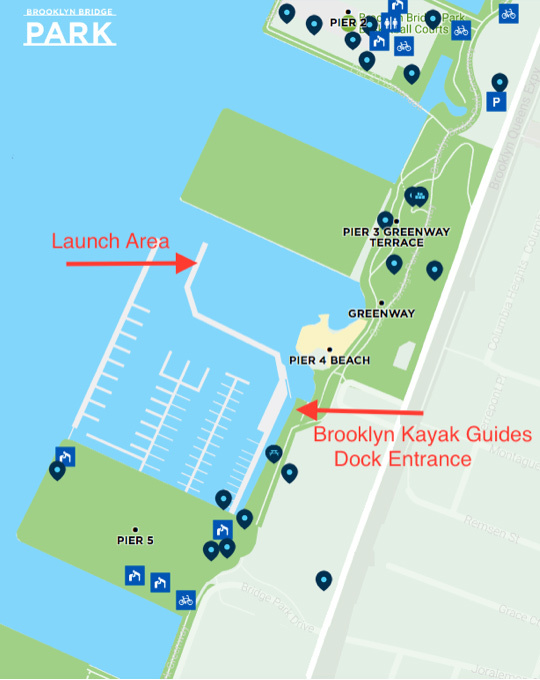 Most classes are in the Pier 4 embayment at Brooklyn Bridge Park, providing a protected and wide area to learn to paddle or improve your skills. Our instructors are experienced and effective in guiding students of all ages through basic strokes, paddling techniques and advanced skills development. Come prepared to have fun--check out our FAQs on what to wear and bring. Join us for a one-hour paddle session in the pier 4 embayment. We start with an on-land orientation and then enjoy time on the water on your Stand Up Paddleboard or your Sit-On-Top kayak. Our instructor is available to provide small group instruction. More experienced paddlers can work on skills improvement and conditioning. Level – All. Available most Friday evenings and Sunday afternoons, June 8 to August 26 by reservation only. If possible, please make open paddle reservations 48 hours in advance. Group sizes are limited. Join us for a one-hour Open Paddle Session in the Pier 4 embayment. We start with an on-land orientation, and then enjoy time on the water on your standup paddleboard. Our instructor is available to provide small group instruction; more experienced paddleboarders can work on skills improvement and conditioning. For more information contact SUP@BKGuides.com. Are you ready to test your CORE strength? Squat, lunge, pushup, twist, turn and laugh your way through a one hour total body workout all while calling on your core strength to keep you on the SUP and out of the water! This two hour class introduces you to the fantastic world of Standup Paddleboards. Learn the basics of board and paddle design, efficient paddling technique, launching and landing, body control and balance. Ready to improve your efficiency and tackle more advanced techniques? This is the class for you. This class will smooth out rough edges and heighten awareness of your board and your body. Depending upon conditions, the class may include a short trip. BKG offers private instruction for individuals & small groups. Individual instruction rates range from $50 to $100/hour. Contact us at to schedule private instruction. A thorough introduction to decked boat kayaking. Learn the fundamentals of your boat, gear, and the essential paddling strokes that make kayaking fun. It’s a huge help to learn correct form early – you will paddle more efficiently and be able to improve rapidly. An 8-hour intermediate class that will take your skills to a new level. Even most paddlers with years of experience will benefit from this thorough exploration of the theory and practice of paddling a kayak. Don’t just thrash through the water: learn proper technique that promotes efficiency & provides a gateway to more advanced skills. Approximately half the 8-hour class will review & fine-tune skills necessary to be certified at Level 2. Depending on conditions we may incorporate a short trip into the review. Then it’s showtime: you will demonstrate, individually and with partners, the paddling and rescue skills that you have mastered. Not everyone will be certified, but everyone will come away with a clear picture of their strengths and areas to improve. This 8-hour class refines your strokes and introduces cool new skills. Learn to paddle with efficency, fluidity, control, and grace. We begin to learn more about paddling in a coastal environment & explore more advanced safety & rescue techniques (detailed curriculum goto American Canoe Association website). This is an 8-hour day of learning & practicing a wide variety of safety & rescue techniques. Self-rescue & group rescue skills are introduced, from essentials to the exotic. Each paddler has a chance to discover which works best under which circumstances. Rescues & recovery techniques must be constantly practiced. This advanced 2 day class is intended for those who will be leading kayak trips & have good personal skills & experience & want to take the next step: leading other paddlers. You will learn how to plan a safe trip, how to lead others effectively, how to minimize risks. We will be offering a 2-day Level 1-2 ACA Instructor Development Workshop followed immediately by a 2-day Instructor Certification Exam. After a summer of improving your skills, you’ll be ready to tackle this instructor training. An introduction to the unique challenges and fun of paddling in swiftly moving harbor currents. Play and experiment with your paddling and rescue techniques in open bouncy water. Pre-requisite: Solid Level 2 skills. Introduction to rough water skills and the joy of playing in moving waters. Beach launching and landing techniques; reading moving water; control in current; use of the stern rudder in current and surf; effective edging and bracing when broached; surf in tide- race; group management, and safety in the surf zone. Held at Democrat Point, Long Island. Pre-requisite: Solid Level 3 skills. Kayak Foundation is a leader in youth kayak programming & instruction. We partner with The Brooklyn Bridge Park Conservancy to provide a range of youth kayak opportunities for camps, youth groups and summer programs. Depending upon their size, weight, capability & class or trip, children 11 years and older may paddle in their own boat and younger children may paddle in a double kayak with a parent or guardian. Contact us to discuss youth kayak classes & activities at our Pier 4 location. For information on the Brooklyn Bridge Park Kids Kayak Program for camps, youth groups and summer programs, please contact the Brooklyn Bridge Park Conservancy. Brooklyn Kayak Guides does not operate its own youth camp – all camp activities are coordinated through the Conservancy. Brooklyn Kayak Guides sponsors a weekly youth winter pool kayaking program at Variety Boys and Girls Club in Long Island City, Queens. For more information, please contact Variety Boys and Girls Club. The Kayak Foundation partners with Brooklyn Bridge Park Boathouse to help administer a Kayak Polo program for youths and adults. We use both Sit-On-Top kayaks (easy to paddle) and regulation competitive decked boats for our sessions. Sessions range from purely social to very competitive. for more information go to BBPBoathouse.org, or to ‘Brooklyn Kayak Polo’ on MeetUp.com. Join Brooklyn Kayak Guides on Facebook!